I am Alfredo Valentine, the owner, founder and principal photographer of Couture Bridal Photography. I offer and deliver the best professional wedding photography in Fort Lauderdale. I became a professional photographer over many years of study, practice and attending various photography seminars. I have been involved in the study of photography for over 24 years. How do I know a professional wedding photographer over a non-professional wedding photographer? This might be the hardest question to answer! A professional wedding photographer or any professional is someone that provides a service for a fee. There are no certifications or licensing that declare a photographer professional or not. Also having a place of business or a studio certainly doesn't qualify a person as a professional either. I know several wedding photographers with beautiful studios in Fort Lauderdale, who I would hardly consider professional, although they do a great job of appearing that way. The best way I would think to tell the difference between a professional and non-professional wedding photographer would be by looking at their body of work, reviews and consistency. I operate out of my home, since 99% of my work is being a professional wedding photographer. In fact, wedding photography is my specialty. There is no need for me to have a studio or store front. Having a store front or studio would only increase my overhead, which I would have to pass onto couples looking to hire me. Why hire a professional wedding photographer when my friend/family member have a really great camera? Choosing to hire a professional wedding photographer is a personal decision. The difference with having a friend/family member photograph your wedding with a nice camera they have might be an option, but you're likely to be disappointed. Just because they have the latest and greatest camera doesn't mean they know what they are doing with it. Additionally, they most likely won't have the lenses and lighting necessary to successfully capture every detail of your wedding day. Moreover, they probably won't have the software and knowledge to get the most out of the images they capture in a stylistic or professional manner. There is so much involved with being a professional wedding photographer that I could write a book on the subject. I will say couples that have used friends and family members as their wedding photographer ended up unhappy and many relationships forever ruined. 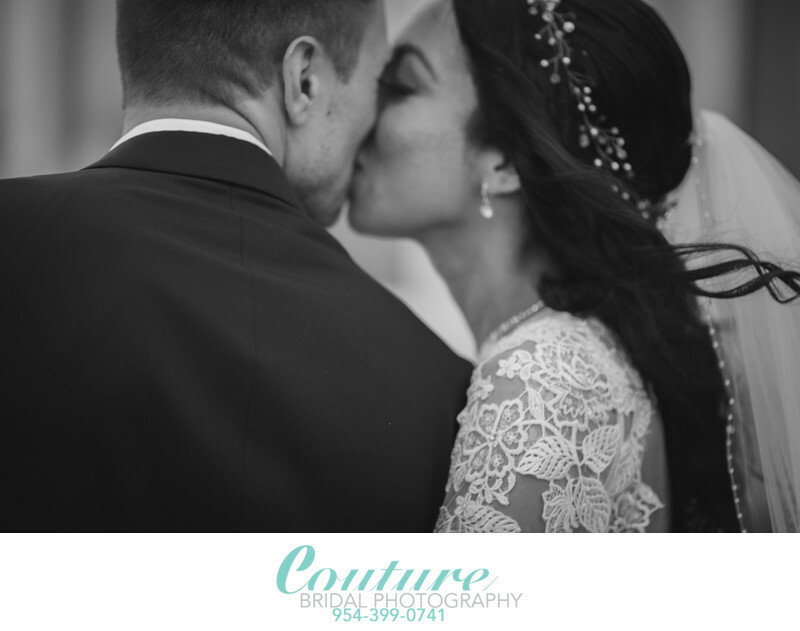 How is Couture Bridal Photography, a professional wedding photography company in Fort Lauderdale? Well for starters, I have over 24 years of photography study, practice and experience. I have attended wedding photography seminars by the best wedding photographers in the world, and I have photographed well over 400 weddings since 2008. I use professional cameras, lenses and lighting that enable me to capture and create beautiful wedding photography in any environment or lighting conditions and more importantly know how to. I have highly modified Apple computers with a variety of editing software to bring the best out of any image and I am well versed and experienced in editing. I also have my own signature style of photography and editing, which makes me standout as one of the top photographers offering professional wedding photography in Fort Lauderdale. Keywords: BLACK AND WHITE (6), Indian Spring Country Club (27), Palm Beach (114), Photojournalism (12). 1/400; f/2.0; ISO 100; 135.0 mm.